Hot Oil Massage, Hot Towel Wrap. Therapeutic hot towel wrap, cuticle conditioning, choice of exfoliant scrubs to smooth skin, masque, massage, polished to perfection. Warm, massage, crystallized scrub, hot towel wrap, cooling marine masque, cuticle conditioning. Paraffin treatment revitalized the skin & polished to perfection. Hot Towel Wrap, Callus Treatment, Exfoliating Scrub, Mud Masque, Hot Stone with Reflexology Massage, Paraffin Wax. Mixed with Your Choice of Natural Herbs from our very own recipe: Chamomile Leaf, Eucalyptus Leaf, Ginger Root, Green Tea Leaf, Lavender Flower, Lemongrass, Peppermint Leaf, Rose Petals, Rosemary Whole or Spearmint Leaf. This manicure is ideally for men including warming paraffin treatment and a deep massage finished with signature lotion. Only at Final Touch Nails & Spa. You will love this luxurious signature service. A "facial for the hands", it includes a hydrating hand and arm warm lotion massage and a juicy, fruit-scented exfoliating scrub to smooth and hydrate dry, rough skin. This service finishes with a stimulating masque to further remove impurities, a therapeutic hot towel wrap, cuticle conditioning and lastly, nails are polished with the finest touch. 1. Soak the client's hands in warm water. 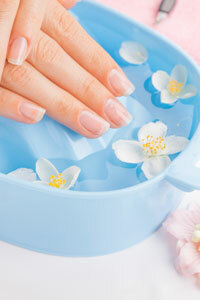 Trim and shape the nails, apply cuticle remover and very gently push cuticles back with a cuticle pusher. Gently remove hangnails around the sides of the nails. 2. 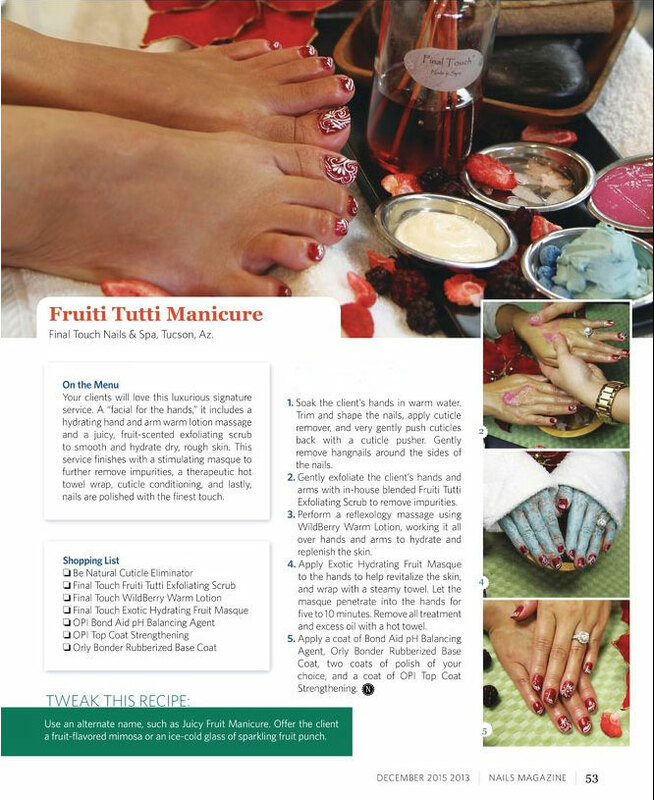 Gently exfoliate the client's hands and arms with in-house blended Fruiti Tutti Exfoliating Scrub to remove impurities. 3. Perform a reflexology massage using Wildberry Warm Lotion, working it all over hands and arms to hydrate and replenish the skin. 4. Apply Exotic Hydrating Fruit Masque to the hands to help revitalize the skin and wrpa with a steamy towel. Let the masque penetrate into the hands for 5 to 10 minutes. Remove all treatment and excess oil with a hot towel. 5. Apply a coat of Bond Aid pH Balancing Agent, Orly Bonder Rubberized Base Coat, two coats of polish of your choice and a coat of OPI Top Coat Strengthening. Our disposable plastic liner Spa Chairs are made in the USA. The patented Clean TouchTM Pipe Free Technology by European Touch replaces traditional jets and internal water lines that can harbor bacteria. The disposable platic liner Spa Chair offers the highest level of hygiene in the industry giving clients peace of mind. Therapeutic hot towel wrap, callus treatment, cuticle conditioning, choice of exfoliant scrubs, masque, relaxing massage, polished to perfection. Callus treatment, hot towel wrap, cuticle conditioning, crystallized scrub, masque, hot stone reflexology, paraffin treatment and polish to perfection. Rosemary Whole or Spearmint Leaf. Fall in love with the aroma. The light flowery fragrance will calm your senses and soothe your tired body as it softens the skin. Add some luxury to your day with this sweet scent that restores skin's healthy radiance. Nature's energy booster, honey contains natural anti-inflammatory compounds that help repair and waken the skin. Sweet? Take a tropical escape. Rejuvenate your skin back to its radiant glow with a burst of citrus that exfoliates and hydrates the skin. Vitamin C provides natural radiance with antioxidants to keep skin looking younger. Experience our luxury perfume fragrance with a splash of orange for the ultimate refreshing sensation. Perfect for dull and blemished skin, Vitamin C protects skin cells and slows the rate of wrinkle-causing damage. Releases a fun bubbling and fizzing Volcano Eruption that blasts away dirt and impurities. Clears away dead skin and reveals mewer, younger-looking skin. Cleanses and thightens pores. Collagen starts to nourish skin for greater alasticity and beauty. Moisturizes as the collagen replenishes skin for a beautiful, youthful glow with a silky soft finish. 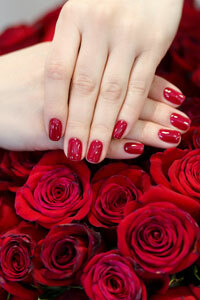 The Perfect Way to combine a relaxing pampering experience with a healthy treat a manicure and pedicure service. Because taking care of your hands and feet are essential to your overall well-being. These services are not just for women, men benefit from this as well. Pressure points of the feet that correspond to specific organs of the body are massaged to relive stress and release energy to the entire body. Essential oils are massaged onto the skin to relax and soothe the body, then warm stones are applied and massaged into the muscles to release tension. We proudly use DERMALOGICA & professional products. A skin care system developed by the International Dermal Institute. This complete treatment is the perfect blend of cleansing, toning, moisturizing and customized masque. This treatment includes a hand massage. 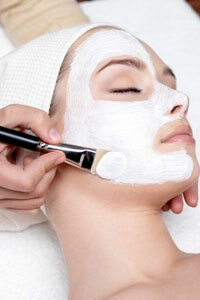 This facial is a deep cleansing and an exfoliation that will restore your skin back to health. An aromatherapy pressure point massage will stimulate blood circulation and revitalize the tissues while the hands experience a soothing massage treatment. Finished with a masque moisturizing cream and sun protection to reveal your skin’s natural healthy glow. This revitalizing treatment begins with a deep cleansing and gentle exfoliation to reveal smooth glowing skin. Also includes a face, neck and shoulder massage to ease your mind and spirit, while a massage of hands will emphasize relaxation. This process will revitalize and help skin protection from harmful sun rays and help restore natural balance of your skin. Deep cleansing treatment, customized for both teens and adults, kills bacteria, eliminates oil condition. 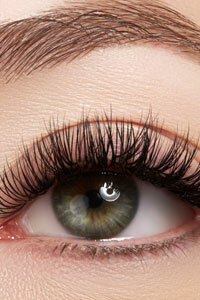 Treatment includes appropriate extractions and high frequency. For children ages 10 & under. See Mani - Pedi section for description. Design to protect your own nails while making them stronger & more beautiful. Your nails are always the same length & the polish will last longer than natural nails. The perfect nails for the professionals. It showcases white nail tips highlighted by a base having natural look. It is a fashion technique of polishing the finger or toe nails in which off white or ivory nail polish is put on to the tips of the nails while sheer polish, soft beige or pastel pink coat is applied to the rest of the nails. 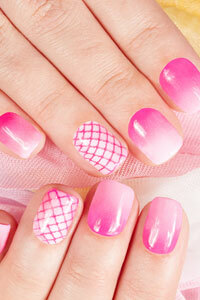 This style is ideal for moderate or short-length nails. Ombre nails are eye-catching and statement-making, a soft gradient effect for the day to day, or glitter ombre nail art for a special occasion. The great thing about ombre nails is that you can make them your own. You can use the same techniques with any colors you choose and really personalize them. Permanent French nails that never chip. Strong, durable and non-yellowing even in tanning beds. They look and feel completely natural and last until the next fill-in without lifting, giving your nails a natural pink & white ambience. It's buffed for a look that's even more beautiful that your natural nails. "No Polish Involved." The Gel gives the nails its strong, long-lasting shine without worrying about discoloration. Diamond Gel is also referred to as a "protective shield". With our diamond gel coating you would be able to remove your own polish without messing your artifical nails. Any contact chemical would not damage your nails. Even acetone can't damage the true beauty of the wet shine look. For French or American polish instead of color polish. The revolutionary nail care with quick UV curing odorless gel nails. Softer than acrylic, gel nails will not turn yellow. Best yet, they work with your natural nails, bending rather than breaking. your beautifully finished nails will be sealed with a high glossy work. Super Excited and Proud to Announce! The World’s 1st latest Revolution 100% Soft Gel-X Extension Technology! For those of you who don’t like or are allergic to Acrylic or just ready to try something new, this is for you… This is an odorless “No Fill-Ins” system, get a brand-new set of nails every visit, lasting up to 3 weeks or longer. - All sculpted tips have the stronger Apex and thicker C-Curve. The Search Is Over... Nail Dip-in Powder is here! Introducing the Next Generation in Nail Enhancement Technology... Dip-in Powders FEEL and LOOK Natural and DO NOT DAMAGE the nail bed. Resistant * Water Resitant * Envionmentally Friendly * Calcium and Vitamin E Fortined. Lasts up to two weeks with zero chips, dents or smudges. gel is cured onto the nail using a LED lamp, allowing the manicure to dry completely within minutes. 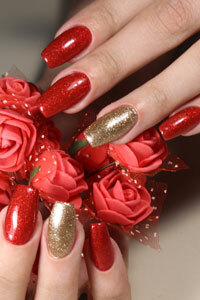 Renowned brands include OPI, Shellac, Gelish, IBD, CND, Orly, Gel II & Kiara Sky.